A common question about the recent large expansions in balance sheets among central bank in advanced economies is about the exit strategy. How easy will it be for central banks to go back to balance sheets of a size consistent with historical levels? Because the expansion of balance sheets represents a fairly unique historical experiment, it some times generates a debate and, at a minimum, uncertainty about how the process will work. While it might not be an example for all advanced economies it is useful to point out that some central banks, such as Japan and Sweden have seen large declines in the size of their balance sheet in recent episodes (Japan in the mid-2000a, Sweden in the Fall of 2010) without any disturbance to the financial sector or interest rates. As an example, below is a picture borrowed from the Riksbank on the evolution of its balance sheet in comparison to the ECB and US Federal Reserve. The central bank of Sweden increased its balance sheet by a factor of 4 (from 5% of GDP to more than 20) in the Fall of 2008 mostly through an increase in loans to commercial banks. After the 2010 Summer, loans have been repaid at a very fast pace and we have witnessed over a very short period of time, just a couple of months, a reduction in the central bank balance sheet of more than 50%. 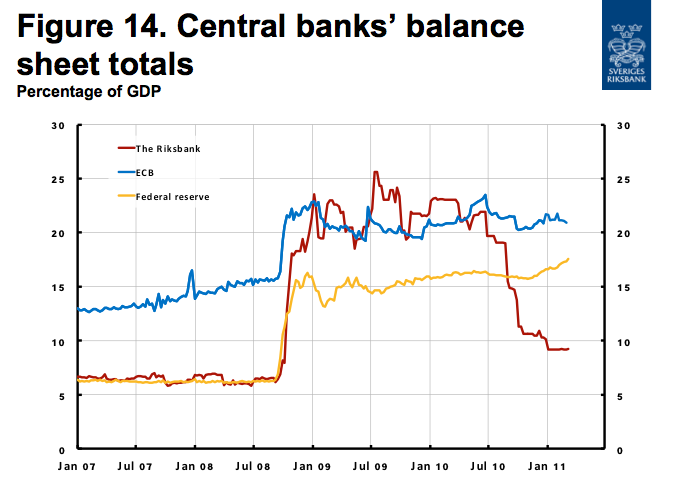 The exit strategy is likely to be different for other central banks that have relied more on asset purchases but it is useful to see a recent historical example of a large and quick reduction in the central bank balance sheet without negative consequences on financial or macroeconomic stability. Do interest payments on government debt matter? In an Econbrowser blog post that reflects on what we have learned from the challenge of Reinhart and Rogoff results, James Hamilton argues that we cannot forget that there are costs to government debt. Some of the points he makes are very good and I think they can be accepted by those critical with the Reinhart and Rogoff interpretation of the evidence, but there is one that I cannot understand well. "The main reason that I personally am concerned arises from the fact that, for any level of the interest rate, a higher debt load means that the government will permanently need to spend more money just to pay the interest on the debt. This is not a matter for arcane debate, but rather is a consequence of the most basic arithmetic. At the moment, the interest rate on U.S. government debt is extremely low, so that despite our high debt load, the government's net interest cost is currently quite reasonable. However, most projections call for interest rates to rise over the next few years, and the most recent assessment by the CBO notes that consensus interest-rate forecasts and existing fiscal legislation imply that within a few years, the U.S. interest cost will be bigger than the entire defense budget, and bigger than all of non-defense discretionary spending." It is true that interest payments on government debt are part of government spending and they will require some form of taxes to generate revenue and taxes are likely to be distortionary. But this cannot be an argument in favor of a reduction of government debt to avoid paying future interests on it. The reason is that to reduce debt you need to find the resources, which means taxes and therefore creating a distortion today. Is it better to create the distortions today or tomorrow? The optimal path of debt (once you have it) depends on arguments that are all related to intertemporal trade offs. Is it better to raise taxes today by a large amount or over the coming years by a small amount? (economic theory tends to suggest that is better to spread the pain over the years). Also, what is the interest rate at which the government can borrow today relative to other interest rates in the economy (which affect how the private sector sees the trade off between paying taxes today or tomorrow)? And there is also the intertemporal tradeoff related to countercyclical fiscal policy (raise taxes when you are close or above full employment). So the real issue is not how large interest payments on government debt will be in the future. The real issue is about difficult intertemporal trade offs associated to taxation and spending in different years as well as how we think about the interest rate faced by government in the context of how the rates faced by the private sector. What are the economic costs of business cycles? Economists tend to approach this question in a way that is very different from the way most people think about economic crises. The academic literature tends to think about business cycles within a framework where economic activity fluctuates around a trend. Within this framework, fluctuations are symmetric. Some times we produce "too little" some times we produce "too much". Asking about the costs of economic fluctuations is equivalent to asking about the benefits of having a path for activity that exactly follows the trend, i.e. we eliminate volatility and we simply grow along a balanced-growth path. How much of a difference this makes is likely to be small. Because we are eliminating both periods of too-fast and too-slow growth, the benefits are only going to be second order through the reduction in volatility or uncertainty. Robert Lucas in his 1987 book estimated the costs of economic fluctuations to be as low as 0.1% of the steady-state level of consumption. While some of his assumptions were challenged by others to make uncertainty and volatility matter more, as long as we keep a symmetric view of fluctuations, their costs are likely to be small. There is a different way of thinking about business cycles which better matches the way most people (not economists) think about recessions. Business cycles are asymmetric in nature. There are periods where we are growing at a normal rate and we are at full employment. These periods get interrupted by recessions (or crisis) where temporarily we produce below our potential. This view of the world which is rare in the academic literature was captured by Milton Friedman in 1964 by what he called the "plucking" model of business cycles. This description of business cycles is also not far from the Burns and Mitchell methodology adopted by the NBER when establishing the dates of recessions for the US economy. 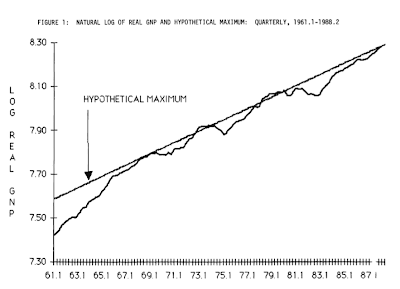 Below is a picture from a paper by Milton Friedman where he tested his model (in 1993). In the above graphical representation the cost of business cycle can be seen as the output that we lose while a recession is taking place -- i.e. 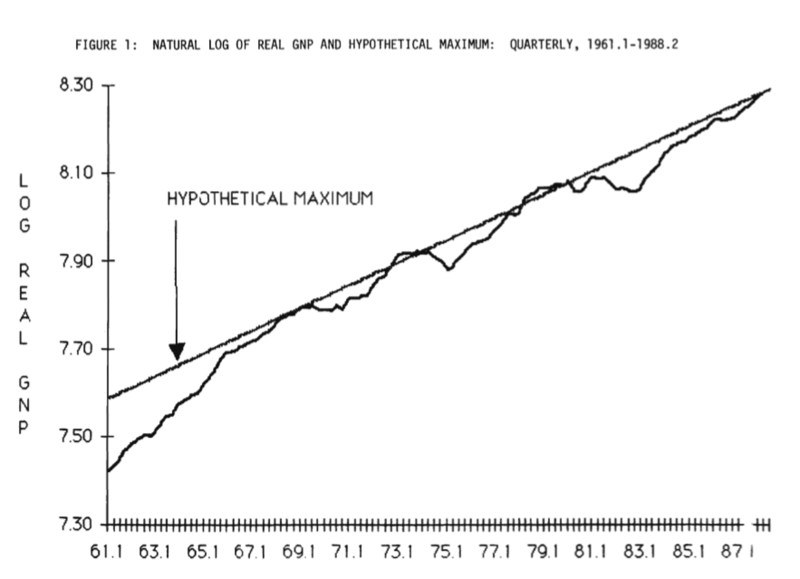 the area between the trend or maximum level of output and the actual level of output. Because there are no periods where we produce above potential or trend, the costs of business cycles are likely to be much larger. Together with Ilian Mihov we have estimated the costs of all the recent recessionary episodes in the US using this approach. In addition, we wanted to understand how costly a slow recovery was in some of these episodes. In our calculations we remove the trend from GDP and look at data through the lens of the figure below. Recessions are defined by the dates provided by the NBER business cycle dating committee. We then produce a date for the recovery (that I discussed in a previous blog post) by assessing when the economy has reached potential or full employment. And then we can calculate the costs of a recessionary episode as the sum of the two triangles. In addition we can calculate how much of the cost is due to the recession phase versus the recovery phase. One caveat before we show our estimates: we are ignoring in our analysis the possibility that the trend itself is also affected by the recession. If this was the case, we would be underestimating the true costs of business cycles. Our estimates are summarized in the table below (more details in our paper). The 1980 recovery is an unfinished recovery so costs are not comparable to the other recessions. The 2007 recovery is not finished yet. The cost is measured as the % loss in GDP compared to the level of GDP at the beginning of the recession (last column is for the total cost; the previous two columns decompose the total cost into the two phases, recession and recovery). We ignore the 2001 recession because it is too shallow and short to produce a reasonable calculation of its costs. The 1980 recession is special because the economy never recovered fully so it is impossible to calculate its total cost. The 2007 recovery is not finished either so the costs are calculated as of the end of 2012 (last observation included in our analysis). Recessionary episodes are costly. In particular the 1981 and 1973 events were the worst until the 2007 crisis with costs close or above 10% of GDP. The current episode is already twice as costly as any of the previous crises (above 20%). The second lesson from the table is that the costs of a crisis used to be higher during the recession phase than the recovery. In other words, recoveries were fast. This is particularly the case in the 1981 episode. Despite this being one of the most costly events, most of the cost is coming from the recessionary period, the recovery was fast enough and not too different in terms of output loss than some of the other shallower recessions. This pattern has changed during the 1990 recession and more so during the 2007 crisis. The majority of the costs are now happening during the recovery phase. In 1990 the recovery phase was twice as costly as the recession (even if the overall cost was small). In 2007 the recovery is already three times more costly than the recession and it is not over yet. Why the current recovery is so slow is still a matter of debate, but as argued by many (including the recent work of Ayhan Kose and co-authors at the IMF) some of the blame has to be on the contractionary nature of fiscal policy (austerity) compared to previous events. While there can be disagreements about the exact dates or the calculated costs we use in our study, what is clear is that an asymmetric view on business cycles is likely to generate significant costs of these recessionary episodes. In addition, these costs are becoming more skewed towards the recovery phase as opposed to the recession phase. This is an important fact that needs to be taken into account when thinking about the potential costs of economic crisis. The costs do not stop when the recession is over, we still need to go through a recovery phase, one that is particularly longer and painful in the current episode. Via Mark Thoma, the Financial Times reports on the expected changes to US GDP accounting rules that are likely to raise the GDP level by 3% when they are implemented in July. I am not an expert on all the technical aspects of measuring GDP (I always hope that whomever is dealing with this is doing an excellent job) but this change reminds us of a fundamental issue with macroeconomic statistics: the lack of good data on NDP (Net Domestic Product), a variable that should be much more relevant than GDP to measure economic performance or welfare or activity. What the future accounting rules will do is to reclassify certain business expenditures (such as R&D) as investment instead of an intermediate input that enters the production function. Why is this relevant? When a business expenditure is simply accounted as part of the production process (as a cost), it only enters in GDP through the value of the final good - to avoid double counting. But when a business expenditure is counted as a capital good it will show up twice in GDP. When it is produced it will show up as investment (a component of GDP). But then, as the asset is used and contributes to the production of the final good, the value it generates is incorporated into the value of the final good. We are doing bad accounting here as the cost to the business (which is captured by the depreciation of the asset) will never show up with a minus sign in the calculation of GDP because GDP is a gross measure of production and not a net measure of production. So if something that was considered a regular business expense (such as R&D) is now included as a capital expenditure it will simply raise the level of GDP. If we calculate NDP (net domestic product) there should be no change in the long-term -- although the profile will look different as in one case, when it is assumed to be a business expenditure, we are simply depreciating the good fully in one year. Most people refer to US business cycles in terms of the recessionary episodes identified by the NBER business cycle dating committee. Their dating of cycles which goes back to the original work of Burns and Mitchell in 1946 consists in identifying periods of "significant decline in economic activity" which are labelled recessions. When the economy is not in a recession we call it an expansion phase. Business cycles are the succession of expansions and recessions. In the NBER characterization of cycles there is no mention of a recovery phase. The recovery phase starts the day the recession ends (what we call the trough) but there is no explicit discussion on how long or how fast the recovery is. The original work of Burns and Mitchell referred to a "revival" phase but this phase was never made explicit in the dating methodology of the NBER. I just wrote a paper (with Ilian Mihov) that produces a date for the end of the recovery for US business cycles. We look at business cycles as a succession of three phases: expansions that are followed by recessions, which are followed by recoveries leading to the next expansion. Our expansion phase corresponds to the notion of an economy that is growing along its balanced growth path with a level of employment and output consistent with the notion of full employment. The recovery is the time that it takes for the economy to go back to full employment. The task of producing those dates is not easy because it requires establishing a measure of full employment or equilibrium (if you are using an economic model). We go through several methods and establish the pros and cons of each of the methods. To our surprise we find that there are quite a lot of similarities across different methods and as long as some judgement is exercised reading the data, one can produce some reasonable dates for the end of the recoveries (the NBER business cycles dating committee also refers to the use of judgement to establish the recession dates). Below is a table with the end-of-recovery dates for each of the US business cycles after WWII. The first column of this table is the quarter where an expansion ends (the beginning of a recession). The second column represents the end of the recession. These two dates are provided by the NBER. The third column is the innovation in our paper, the date when the recovery ends. As an example, in the fourth quarter of 1973 an expansion ended, a recession started. That recession ended (according to the NBER) in the first quarter of 1975. At that point the recovery started. This recovery finished in the third quarter of 1976 where an expansion phase takes over until the next recession in the first quarter of 1980. There are three recessions for which we cannot provide an end-of-recovery date. The 1980q1 recession ended in 1980q3. But the recovery that started then was never completed because before the economy went back to full employment a new recession started (1981q3). The 2001q1 recession is a special one. It is very short and shallow and it difficult to identify a proper recovery -- some argue that this does not constitute a recession -- so we have decided not to provide a date for the end of this recovery at this point. And the 2007q4 recession that ended in 2009q2 has produced a slow recovery that is not over yet (it is far from being over according to our methods). One way to summarize the evidence above is to look at the length of the recession and compare it to the length of the recovery as identified by out dates. What we see is that most recoveries have been of similar length to the recessions. Some recessions (such as the 1973) were longer and so was the recovery. The 1990 recession had an unusually long recovery despite the fact that it was a mild recession. And the 2007 recession has led to a recovery that is already 15 quarters long and it is not over. The 2007 recession/recovery pattern fits that of the 1990 one where the recovery is significantly longer than the recession phase but the asymmetry is even larger. P.S. A draft of the paper that we presented at a conference at the Boston Fed last weekend can be found on my web site.